One of the great pleasures of living in Japan is to sample bits of the month by month procession of its SEASONAL and CEREMONIAL sweets. Whether at supermarkets, convenience stores or specialty WAGASHI ( Japanese sweets) SHOPS (and their outlet counters found in department stores), it is always a delight to the eyes, and later to the tastebuds, to find that the types of sweets on display have changed each month, giving us a strong sense of SEASON and an awareness of upcoming festivals and traditional events. One such treat, OHAGI, appear not once a year, as do most other special wagashi, BUT TWICE! This is because these palm-sized patties of partly mashed sticky rice coated with a surrounding layer of mashed sweet beans, are the representative sweet for the EQUINOX DAYS, which as you know come around twice a year, in March and September. For the Japanese, the equinox days, and the 3 days before and after them, are called O-Higan. During these 7-day periods ( or some time around them), it is customary to visit ones family graves, clean them, and make offerings of incence, water, sake, fruit, and OHAGI ( though now many temples and cemeteries forbid leaving food offerings behind as they attracts crows!). What makes these sweets an especially complicated topic, is the matter of what to call them. Originally, those prepared for the SPRING EQUINOX were called BOTAMOCHI. This is because the flowers BOTAN ( peonies), bloom in and are representative of spring. Some people and writers still use the name BOTAMOCHI when referring to these sweets prepared in March. On the other hand, the same wagashi ( or a slight variation depending on region and era) were called OHAGI, since the hagi ( bush clover) is one of Japan`s famous flowers of autumn. 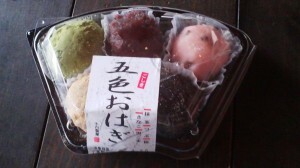 For some reason, however, perhaps because using two different names for the same sweet could be confusing for consumers (and is thus avoided at the suggestion of the marketing specialists employed by the big department and convenience store chains), these wagashi are now mostly labelled as O-HAGI whether they be sold in autumn or winter. 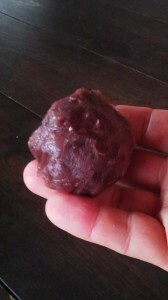 Most people these days have also started to use the name OHAGI for the equinox cakes in both seasons. For me, this is a strange state of affairs because the word O-Hagi, clearly deriving from the Japanese name for bush clover, is resplendant with the image of AUTUMN. I thus strongly prefer to use the word BOTAMOCHI for OHAGI in the spring. In past ages, it was common to have slight differences between the O-Hagi of each season. Sometines we can find remnants of these past customs. For example, while the autumn O-Hagi might be slightly oval and a little smaller, the BOTAMOCHI would be big and round, like the peonies which bloom in spring ( see the photo above). Some people have also told me that BOTAMOCHI should be made with sticky rice ( mochi gome), while for OHAGI, regular rice ( uruchi gome) should be used. In both seasons, past or present, a characteristic of these equinox week sweets has been that the rice be only partially mashed, leaving the grains mostly intact. This was called HAN KOROSHI ( 半殺し), literally half killing, and this term has actually been a nickname of these sweets. There is a comic story told in which a guest at an inn overhears the proprietor suggesting his wife make some OHAGI by saying HAN KOROSHI NI SHIO-, which could also be taken to mean- lets half kill him! As you can imagine, the panicking guest, wasted no time in getting the hell out of there! If only he knew he was only going to served some OHAGI! You may ask, as I have, just why this particular type of sweet is eaten during OHIGAN. Well, the fact is no one knows for sure. Sweet beens were long believed to have disease preventing powers and of course rice has traditionally been thought to be heaping with LIFE FORCE. No matter why they are eaten at the equinox weeks, we can still be happy that we have them to look forward to- TWICE A YEAR! (I have found, since I wrote and posted this article. that there are some areas of Japan, especially in rural North-Eastern Japan ( Tohoku) and Hokkaido who use the name BOTA MOCHI even today, AND for both seasons! Two women, one from Fukushima Prefecture and another from Hokkaido told me that in their home areas they NEVER say Ohagi. For them, that word connotes the elegant image of the big city, while their local cakes are big , round and rustic- in other words BOTA MOCHI ! 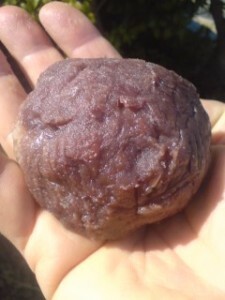 More wild fruit picking in Japan- YAMABOSHI (山法師)- the fruit of the kousa dogwood tree! Learn something new today. All these years I’ve only heard of ohagi in my area but not botamochi. Didn’t even notice the difference in size. Most of my American friends are not used to eating atsugi or even sweet bean paste. They told me that beans are not used in their desserts or confectioneries; the beans are considered vegetables.